Caring and nurturing every senior adult. 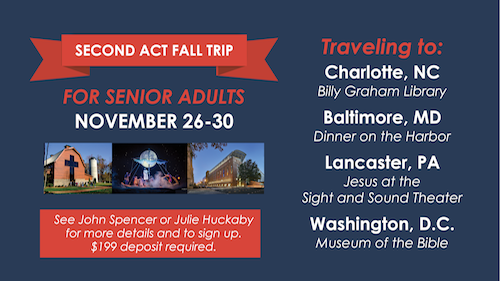 Join the Senior Adults at Sherwood for regular luncheons, retreats and various avenues of service in which to exercise your spiritual gifts! Please see John Spencer or Julie Huckaby for more details and to sign up. $199 deposit required at sign up. Senior Adult luncheons are held once a quarter in the Fellowship Center. The cost is $5 per person. Weekly visits are made to those who are not able to attend church services and group events on a regular basis. Each person receives Sunday School literature every quarter, by request. For more information on the Senior Adult Ministry, call 229.883.1910.